In today’s busy and cluttered lives, it’s easy to lose focus on what matters—even if you hire a cleaning service to handle the dirty details. That’s why we focused on five gratitude projects that are not only fun to do, but that also include loved ones, inexpensive materials, personal reflection, and personal style. This Thanksgiving-themed clothespin wreath from Chica and Jo is a simple, yet fun way to let everyone who walks through your door share in the art of thankfulness. All it takes is a wire wreath frame and enough clothespins to go all the way around. Keep a marker handy, and invite family and friends to write their names and what they are thankful for on the top of the clothespins. At the end of the project, you’ll not only have a lasting reminder of so many blessings, but you’ll also have a circle of names to remind you how connected you are to the people in your life. And isn’t that a blessing, too? We’ve got to hand it to Tiffany at Simple Modern Mom for this gorgeous take on a leaf garland. Using paper bags, construction paper, a variety of card stock and raffia, she weaves a way to not only make thankfulness an artform, but also celebrate blessings all month long. Start in early November and get the whole family involved. This is one Thanksgiving craft that has “holiday tradition” written all over it. Get the instructions here. We all know that counting blessings isn’t just a Thanksgiving thing, it should be an everyday thing. And if you want to make it an active part of your life, it deserves to find a physical place in it. And that’s where this beautiful mobile comes in. 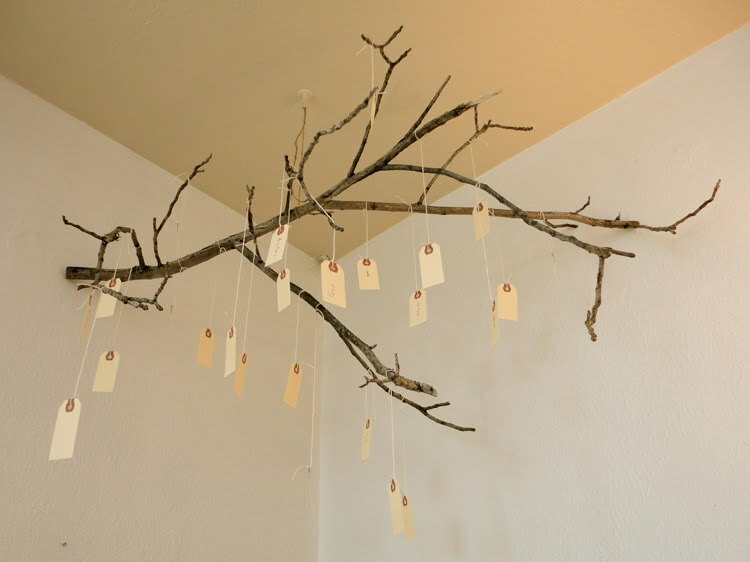 This inexpensive project uses an interesting branch, package hangtags, and string to showcase everything you and your family are thankful for. Sometimes being grateful is all you need to keep your chin up. And in this case, looking up can be a good reminder. Find the full instructions at Titanium White. This no-sew fabric fortune cookie craft can be made once and used for years or could be a lovely present to anyone who needs to be reminded how special they are. Just make the fabric fortunate cookies as directed here and slip in narrow pieces of paper filled with why you are grateful. This is definitely a gift that keeps on giving; use these as table decorations, fill them with poetry, or other ways to spread some grateful sunshine. It seems that no one is sending mail these days, and we feel like it’s a shame. Why not use the remaining weeks of the year to reflect on the people who made your happiest moments possible? Write it in a simple thank you card, or draft a letter telling each person why they mean so much to you and what makes them special in your eyes. You’ll give them something unexpectedly lovely in their mailbox, and feel better knowing that what you feel in your heart is now known. Which one of these gratitude projects will you try? Let us know in the comments!